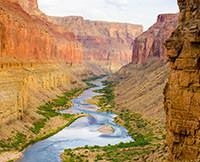 Rafting the Grand Canyon has been on my Bucket List for years. 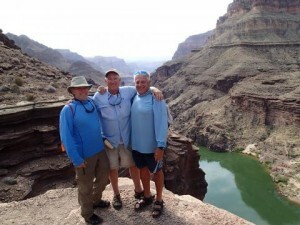 I had been to the Grand Canyon as a Boy Scout in 1959, and had done the helicopter tour a couple of times more recently. NOTHING can compare to the 7 Day Rafting Trip. The one thing that I am the happiest about is the fact that I went with Western River Expeditions. No other company can possibly exceed their professionalism, attention to detail, and the overall experience they create. Every time we would pass another company's rafts on the Colorado River, all the guys on our raft would comment that we sure are glad we are on THIS raft. We saw NONE that we would have preferred over Western River. From the very beginning of our journey, when Steve Wiley gave an overview of what we could expect and what they expected of us, I knew we were in for a real treat. Wiley was so thorough in covering every conceivable question. He left nothing to chance, and explained the "Why" of every instruction he gave. He and Gracie were patient, understanding, and helpful...while keeping everyone on the same page. While for some it could have been like herding cats, Wiley and Gracie did it effortlessly. The young guys helping them were the bright, clean cut, respectful, personable, knowledgeable young men anyone would be proud to call their sons. I have already started polling my friends as I start working on a return trip. I'd be tickled to death to know I could have the same Captains next time. Although I've done some freelance rafting here in Tennessee, this is the first time I've gone through an outfitter such as Western River Expeditions. I'd be up for any trip that Western River Expeditions organizes...and don't think I'd consider anyone else. It just doesn't get any better. Everyone on our two rafts raved about the food they served us. We could not believe the quality and variety of meals we enjoyed. I've been on plenty of camping trips in my life, but have never experienced anything approaching my recent trip through the Grand Canyon. I could go on and on, but will close by saying, Thank you, Wiley! Thank you, Gracie! Thank you, Keifer! Thank you, Sam.